He reminded, that K-550 'Alexander Nevsky' is stationed at the Pacific Fleet`s submarine base in Vilyuchinsk (Kamchatka peninsula). The submarine transited from a Northern Fleet base to the Vilyuchinsk base in Autumn 2015. "In August-Septmeber 2016 the second serial-produced Project 955 SSBN, namely, K-551 'Vladimir Monomakh', armed with 16 R-30 Bulava (SS-NX-30 Solaris) submarine-launched ballistic missiles (SLBM) will transit from the Gadjievo base (the Northern fleet) to the Vilyuchinsk base (the Pacific fleet) under the Arctic ice cap. ", the source pointed out. "The Pacific fleet is planned to receive two more Project 955A submarines armed with R-30 Bulava SLBMs in the early 2020s", he added. According to him, Project 955/955A SSBNs will form the backbone of the Russian sea-based strategic nuclear forces in the Far East region in the decades to come. 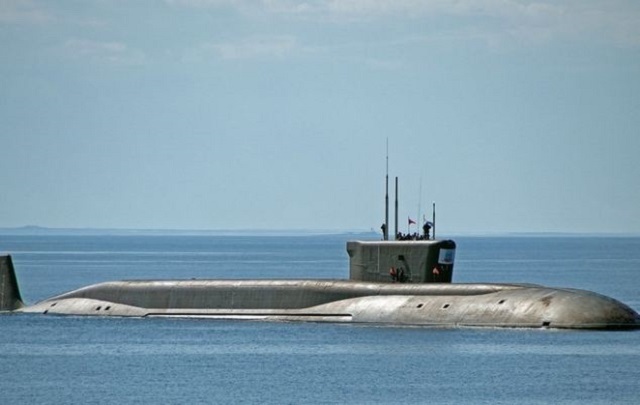 "They will replace three ageing Project 667BDR (Delta-III) SSBNs based at Vilyuchinsk. The Delta-III submarines will be decommissioned within a few years", the source said. At the same time, the Northern Fleet will receive four Project 955/955A SSBNs. As of early 2016, Russian Navy deploys three Project 955 (Borei-class) submarines. Four SSBNs are being produced in upgraded Project 955A configuration. The fifth Project 955A submarine (the last SSBN of the project) is supposed to be laid down in 2016. There is not external diffrence between the Project 955 and 955A submarines. The Project 955 SSBNs incorporate previously produced hulls refurbished by Sevmash plant after the refunding of the Borei program, while new hulls are laid down for the Project 955A submarines.